Jebelli’s own crusading zeal fuels every passage, said Jason Heller in NPR.org. When his account touches on research breakthroughs from the past few decades, “he tracks down researchers and patients alike,” crisscrossing the globe to capture the scientists’ passion and the patients’ quiet suffering. 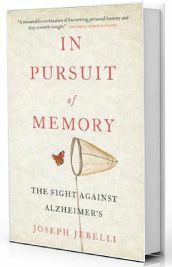 When molecular geneticist Alison Goate undertakes a nearly impossible search for a genetic mutation common in Alzheimer’s patients, the story reads like a suspense tale—one with a happy payoff.